Between early 1943 and until the end of World War II the ‘Order of Battle’ of the Waffen-SS rose from 8 to 38 divisions with nearly one million men. The elite SS Panzer and Panzer-Grenadier Divisions from this and the following page represented Germany’s most effective troops in the last stages of the war, setting a standard unsurpassed and seldom equalled among the forces of any other nation. Tiger tanks of LAH in Normandy, 1944. Surrendered to US Army on 9 May, 1945 near Linz, Austria (only 1,500 survivors with 16 tanks, released in 1950). Total strength in June 1944: 19,700 men. Elements responsible for murdering 80 British POWs at Wormhout in May 1940 and 71 US PoWs at Malmedy in December 1944. Grenadiers of 2 SS division ‘Das Reich’ advancing during the Battle of the Bulge. October 1939 (as Panzer-Division on November 9, 1942). SS-Ogruf. Hausser (until October 1941), SS-Brigaf. Bittrich (until December 1941), SS-Brigaf. Kleinheisterkamp (until April 1942), SS-Gruf Keppler (until February 1943), SS-Brigaf. Krüger, SS-Brigaf. Walther, SS-Brigaf. Lammerding (December 1943 to July 1944 abd December 1944 to January 1945), SS-Gruf Ostendorff, SS-Standartenführer Kreutz, SS-Standartenführer Lehmann. Combat campaigns in Holland, Belgium and France to the Spanish border (May, June 1940). In December 1940 the ‘Germania’ regiment was withdrawn. Occupation service in France (until April 1941). In the Balkan campaign attack on Yugoslavia (April 1941) and refresh in Austria (May 1941). Participation in Operation Barbarossa in the central front: Smolensk, Priluki, area around Moscow (June to November 1941). Defense battles at Istra, Rusa, Rchev (December 1941 to March 1942). Refreshing, re-equipment and reclassification to the Panzergrenadier Division in Germany (March 1942 to July 1942). Occupation service in northwest France (until January 1943). Russia: heavy fighting at Kharkov and recapturing of the city (February and March 1943). Battle of Kursk, combat at Bielgorod and Prohorovka (July 1943). Heavy defensive fighting at the Mius, west of Kharkov, at the Djepr, Kiev and Zhitomir (August to December 1943). Combat group Lammerding still in action, the remainder of the division relocated to France for refreshing and re-equipment (May 1944). After D-Day marched to Normandy; the company of SS Stubaf. Dickmann of the Regiment ‘The Fuehrer’ murdered 642 civilians in Oradour-sur-Glane. Heavy fighting in the area of Coutances, St Lo, Percy and Mortain (June to August 1944). 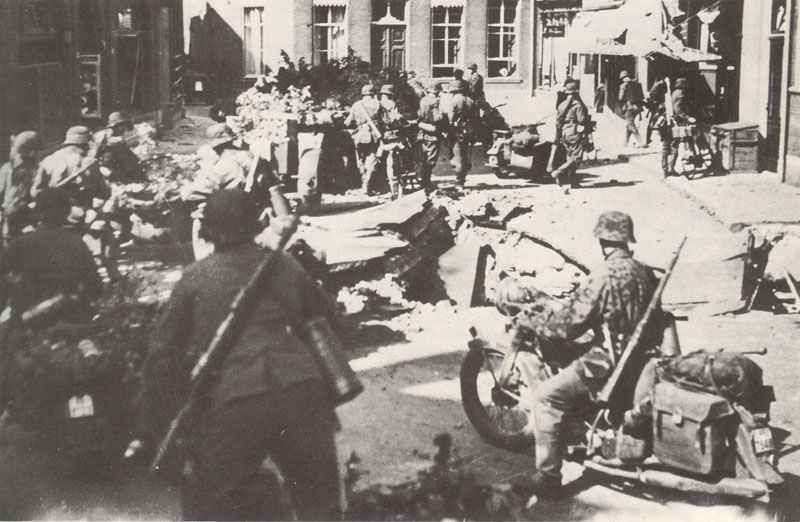 Retreat via Rousen, St Vith, German border (August and September 1944). In action in Snow Eifel (September to December 1944). Ardennes offensive (Battle of the Bulge), heavy fighting (December 1944 and January 1945). Moved to Hungary, heavy fighting in the spring offensive at Stühlweissenburg (February and March 1945). Retreat to Austria, fighting against the Red Army near Vienna and in Czechoslovakia (April 1945). Majority surrendered to US near Pilsen, Czechoslovakia on 8 May 1945. 2 motorized infantry regiments (Panzer-Grenadiers; most with APCs), each with 3 battalions (instead of 2 by Wehrmacht divisions). 1 Panzer regiment with 10 companies (since spring 1944 4 companies with Panzer V Panther, mid-1944 one company with Tiger tanks; TOE strength 1944 each 12 tanks), 1 battalion of 18 StuG 40 assault guns, 1 anti-tank coy of 14 (1944:12) self-propelled guns, 1 artillery battery of 12 self-propelled artillery guns Hummel. First and oldest Waffen-SS division. One company commanded by Dickmann murdered 642 men, women and children at Oradour-sur-Glane, June 1944. Motorcycle troops of 3 SS Totenkopf division near Dunkirk 1940. November 1939 (as Panzer-Division on October 23, 1943). SS-Gruf. Eicke (until February 1943), SS-Brigadeführer Keppler, SS-Oberführer Simon, SS-Brigaf. Priess (October 1943 to June 1944), SS-Brigaf. Becker. Heavy fighting in the Western campaign: La Cateaum, Cambrai, Arras, Dunkirk, Seine and Loire, Lyon, Charente (May and June 1940). Occupation service in France (until June 1941). Operation Barbarossa: Action in Lithuania at Vilna and Luga (June to September 1941). Section of Leningrad (September to December 1941). Defensive fighting in the area of Cholm and Demjansk (January and February 1942). Subsequently, only battle group Simon in action (until June 1942), breakthrough to Demjansk and Lovat (April 1942). Defensive combat north-west of Demjansk (July to October 1942). Refreshing and re-equipment in France (October 1942 to February 1943). Russia: heavy fighting and recapture of Kharkov (February and March 1943). Fights in the Byelgorod area (April to July 1943). Battle of Kursk (July 1943). Defense battles at Isjum, Kharkov, Dnieper and Krivoi-Rog (until January 1944). Retreat to the Romanian border and defensive battles (January to April 1944). Relocation to the northern section of the Eastern Front (June 1944). Battles for Grodno (July 1944). Heavy fighting in Poland: Warsaw, Narev bridgehead, Modlin (August to December 1944). Relocation to Hungary (December 1944). Attempt to relief Budapest (January 1945). 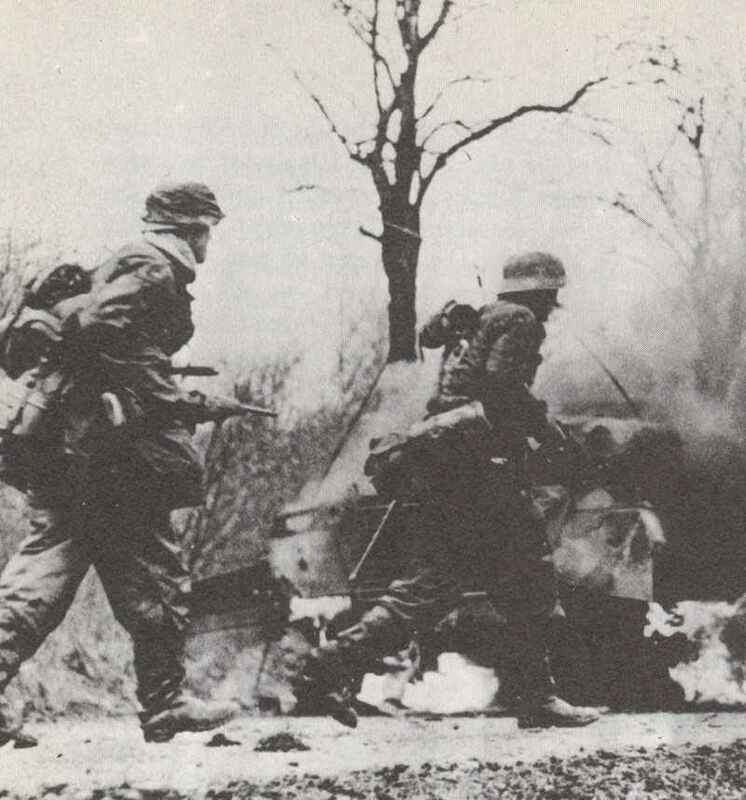 Retreat and fighting around Stuehlweissenberg (February and March 1945). Retreat to Austria, combat north-west of Vienna (April and May 1945). 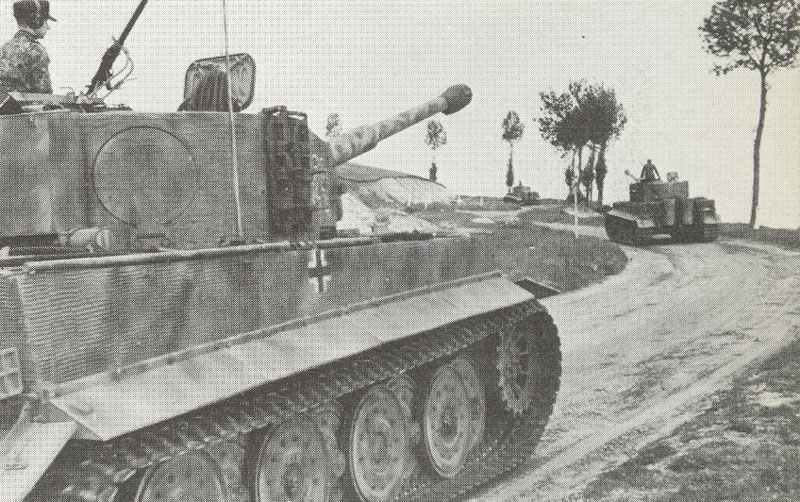 Surrendered to US near Linz, Austria (less than 1,000 men and 6 tanks). Mid-May handed over to Russians. 2 motorized infantry regiments (most with APCs), each with 3 battalions (instead of 2 by Wehrmacht divisions). 1 Panzer regiment (10 companies, including one with Tiger tanks; TOE strength 1944 each 12 tanks), 1 Artillery battery of 12 Hummel SP-guns, three anti-tank coys from 1944 with 12 StuG 40, three assault gun companies with 18 StuG 40. Created original from concentration camp guards. Reinforcements by volunteers and conscripts. Responsible for murdering approx. 100 British PoWs at Le Paradis, May 1940 (instigated by a hysterical SS-officer over the losses suffered by his ill-trained men against these British soldiers). Since 1941 highest combat reputation.